Pensioner Jim completes a Dopey Challenge! A local athlete in his 70s has just completed an amazing ultra-distance challenge in America. Jim Fell, who runs for Werrington Joggers, does triathlons for PACTRAC and cycles for Fenland Clarion, completed the 2016 Dopey Challenge in Disneyworld, Florida. Jim was one of thousands of runners who lined up to compete in the event which comprises four running races (a 5k, 10k, half-marathon and marathon) in the space of four days. A total of 6,576 runners lined up to do all four races, which covered a distance of 48.6 miles, with thousands more doing just one or two races. Jim went the whole hog. 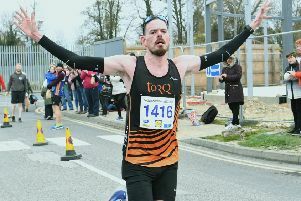 First he clocked a new Werrington Joggers Over 70 age group record of 23:37 and then the next day finished the 10k in 48:17 (23:28 + 24:49) to create not only a new club over 70 record for the 10k, but also for the 5k in the same race. He placed 346th overall in the 10k and was first Over 70 runner home. Next up was a half-marathon in 1:54:48 and then 22 hours later he clocked 4:49:35 for the marathon - yet another Werrington Joggers age group record. Jim came second in his age group in the marathon, narrowly missing out on the top spot by 33 seconds after having led all the way to the 26-mile mark. Jim won his Over 70 Age Group in the Dopey Challenge, having meticulously planned his tactics, training and potential jet lag. He even arrived in Florida just two days before the first race, so that he would be used to getting up at 3am for the races. The marathon started at 5:30am at well over 90% humidity. Two more PACTRAC member were involved in parts of the Dopey Challenge. Lorna Hope, competed in her first ever running race, clocking 46:41 in the 5k. Not quite as daft as Jim, Steve Hope tackled just the marathon. He finished 2,748th out of 19,838 finishers in a time of 4:29:02. “I had to manage a recent injury, so was happy to run the whole way round without walking,” said Steve.